Dr Hassan Khosravi is a Senior Lecturer in the Institute for Teaching and Learning Innovation and an Affiliate Academic in the School of Information Technology and Electrical Engineering at the University of Queensland. Prior to joining the University of Queensland, he held a Lecturer position in the Department of Computer Science at the University of British Columbia. 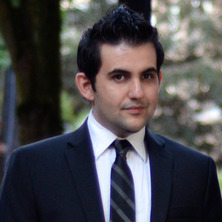 Hassan holds a PhD from the School of Computing Science at Simon Fraser University in Canada and a Masters degree in Computer Science from the University of Amirkabir University of Technology, Tehran, Iran. As a computer scientist by training, he is passionate about the role of artificial intelligence in the future of education. In his research, Hassan aims to apply insight from adaptive learning, peer learning, crowdsourcing and recommender systems to narrow the gap between these large bodies of research, and practical implementations that contribute to personalisation of education. For more information on his work please visit his website. Abdi, Solmaz, Khosravi, Hassan and Sadiq, Shazia (2018). Predicting Student Performance: The Case of Combining Knowledge Tracing and Collaborative Filtering. In: Proceedings of the 11th International Conference on Educational Data Mining. International Conference on Educational Data Mining, Buffalo, NY, United States, (545-549). 15-18 July 2018. Are you interested in applying novel and innovative analytic approaches from fields such as machine learning, data mining, and visualisation to address highly challenging and world-changing tasks such as enhancing and personalising education? If yes, then please send me an email supplying a cover letter, your academic transcript with grades/GPA , and your CV. You can find a list of my current projects on my website. I am currently accepting full-time PhD and MPhil students. For informtion on applications, entry requirements, and scholarships at the University of Queensland pleease visit this link. Khosravi, Hassan, Cooper, Kendra and Kitto, Kirsty (2017) RiPLE: recommendation in peer-learning environments based on knowledge gaps and interests. Journal of Educational Data Mining, 9 1: 42-67. Khosravi, Hassan, Schulte, Oliver, Man, Tong, Xu, Xiaoyuan and Bina, Bahareh (2010). Structure learning for Markov Logic Networks with many descriptive attributes. In: AAAI-10 / IAAI-10 - Proceedings of the 24th AAAI Conference on Artificial Intelligence and the 22nd Innovative Applications of Artificial Intelligence Conference. 24th AAAI Conference on Artificial Intelligence and the 22nd Innovative Applications of Artificial Intelligence Conference, AAAI-10 / IAAI-10, Atlanta, GA, United States, (487-493). 11-15 July 2010. Khosravi, Hassan and Colak, Recep (2009). Exploratory Analysis of Co-Change Graphs for Code Refactoring. In: Advances in Artificial Intelligence, Proceedings. 22nd Canadian Conference on Artificial Intelligence, Kelowna Canada, (219-223). May 25-27, 2009. Khosravi, Hassan, Muslukhov, Ildar and Luong, Peter (2015). Method and System for Decoupling User Authentication and Data Encryption on Mobile Devices. 9137659.